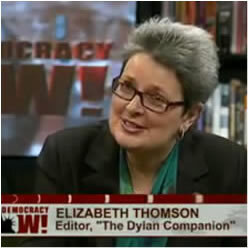 Liz Thomson is a London-based journalist who has contributed articles and interviews to newspapers and magazines around the world. A contributor to The New Grove Dictionary of Music & Musicians, she is the co-editor (with David Gutman) of quasi-academic studies of John Lennon, Bob Dylan and David Bowie, and the author of a forty-year celebration of Chickenshed, the uniquely inclusive theatre company. She has lectured at Liverpool University’s Institute of Popular Music, Kingston University, University College London and Oxford Brookes, and has been a Visiting Fellow of the Open University Sixties Research Group. An occasional broadcaster, she has conducted live interviews with authors on platforms at literary festivals from Dartington to Dubai and points in between. The Village Trip , a new annual festival celebrating the history and heritage of New York’s Greenwich Village, was launched in 2018. The four-day event featured music, poetry, drama and photography and includes Bringing It All Back Home to Washington Square, a concert in the Park honoring the rich musical legacy of the Village, was headlined by Suzanne Vega. The legendary David Amram was the festival’s Artist-in-Residence. The Village Trip 2019 takes place from September 26-29 at venues across Greenwich Village. As one wit put it, “Everything started in the Village – except Prohibition”. Square Roots Productions, a UK-based charity co-founded with Anthony Keates, aims to celebrate and nurture the shared folk music heritage of the British Isles and North America – the real “special relationship”, a rich tradition which offers a different though no less important alternative to written history. The Desmond Elliott Prize, “the UK’s most prestigious award for first-time novelists” (Daily Telegraph), is named in honour of literary agent and publisher Desmond Elliott, who died in 2003, his will stipulating that the proceeds of his estate be used to fund an award that would “enrich the careers of new writers”. Liz is a co-founder trustee of the Prize, which this year celebrates its tenth anniversary.